The Star-Nosed Mole is a smale mole, that inhabit wet lowland areas of North America. They have a strange appearance, with a unique star-shaped nose that’s ringed with 22 fleshy apprendages (called ‘rays’), which they use to feel its way around, and even hunt prey. They are members of the order Eulipotyphla and family Talpidae, which are small, dark-furred moles, shrew moles, and desmans. 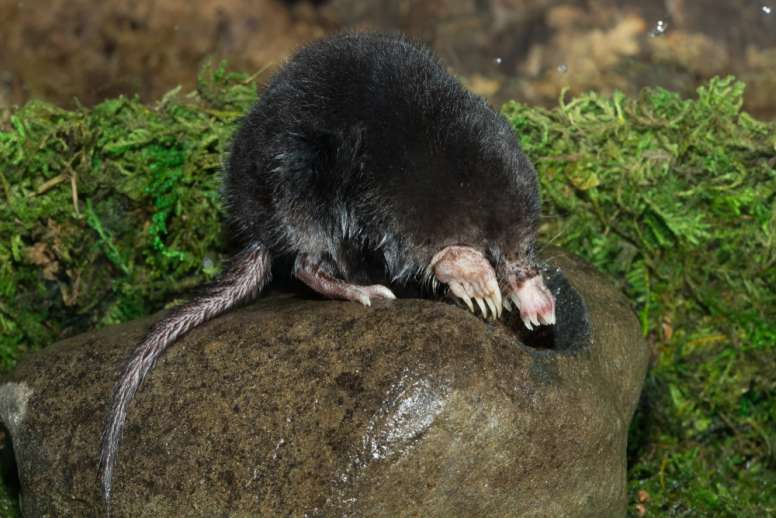 Star-nosed moles are found primarily in forests, marshes, wetlands, swamps and near water. However, they are sometimes also found in dry meadows further from water. They are active both during the day and night, and are still active still during the winter, continuing to tunnel and forage for food in snow, and will swim in icy streams and under frozen ponds. The star-nosed mole is covered in dark brown, water-repellent fur and have broad feet with claws. A fully grown, adult star-nosed mole typically measures only around 6-8 inches in length, while its tail is thin and hairy and 1-2 inches in length. They weigh around 50 grams when fully grown. The star-nosed mole is a carnivore, and it’s diet is small invertebrates (animals without backbones). It eats aquatic insects, worms, mollusks, small amphibians and small fish. 1. Their ‘nose’ isn’t used for smelling, it’s used for touch to feel around, and hunt prey in darkness. The mole hunts by bopping its star nose against the ground rapidly; it can touch up to 12 different places in a single second. 2. Their star-nose rays are in constant motion when exploring. The small finger like rays of the star are constantly moving, ‘touching’ and ‘feeling’ what’s around the mole. 3. Their star is the most sensitive touch organ known in any mammal. 4. 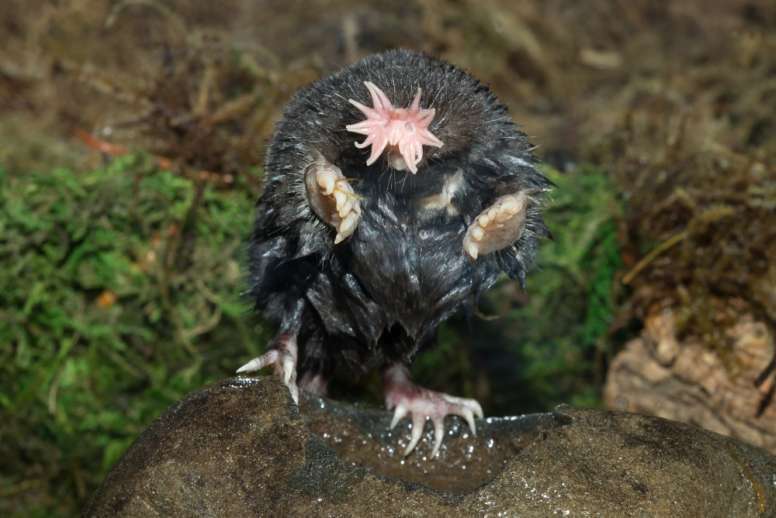 Star-nosed moles are functionally blind. Their eyes are barely visible due to their dense fur, but like all moles, they aren’t completely blind – they are colorblind and see poorly. They can only see light and movement. 5. The star-nosed mole ‘sees’ the world with its star. 6. They eat faster than any other mammal on earth. Due to the vast sensory receptors in it’s star, the star-nosed mole is able to find an object, determine if it’s edible, and then eat it (if it’s an insect or worm) in under a quarter of a second. 7. The star-nosed mobile is semi-aquatic. 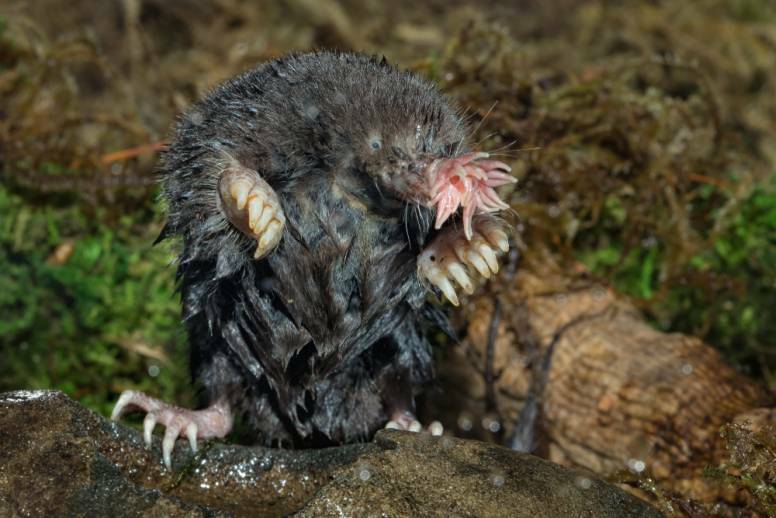 There are 39 species of mole, and the star-nosed mole is the only species that lives in swamps and marshes. They are excellent swimmers and propel themselves forward using their feet and tale. Bottom-dwelling aquatic invertebrates are the principal winter foods of star-nosed moles living near water. 8. They can smell underwater. It’s widely been accepted that mammals can’t logistically smell underwater, however the star-nosed mole has deivsed an ingenuis workaround. They sniff underwater by blowing bubbles towards an object, and then re-inhaling the same air bubbles to retreive their scent, and smell them. This is thought to help detect both prey, and potential predators. 9. Star-nosed mole use their front legs as shovels. They use them to dig shallow tunnels up to 100 feet in length, for foraging through marshes and swamps. They are excellent diggers, and their broad feet are equipped with claws, ideal for moving dirt. They also use them for burrowing their nests underground. 10. Like all moles, they burrow to nest and can make ‘molehills’. They generally build their nest in deeper tunnels away from predators, usually below a protective structure, like rocks or logs. They use sticks, leaves and dry grass to line their nests and stay dry. 11. In winter it’s tale swells up with fat, making it 4 times larger than it’s normal size. It serves as a fat storage organ, to help the mole survive the winter months. 12. The star-nosed mole is the only mole thought to live in colonies. Most moles are solitary animals, only socializing when they reproduce. Little is known about their social behaviour of the star-nosed mole, but they are thought to live in small ‘loose’ colonies. 13. Star-nosed mole mate once a year and the male and female separate after birth. They mate in February to March, and produce a spring litter, usually in April to May and produce one litter of 2 to 7 young. After birth, the female generally raises the young alone. 14. Their population is stable and there are no significant threats to the species. “A Nose for Touch”, via The Scientist. “Totally bizarre facts about the star-nosed mole”, via Science Daily. “Condylura cristata”, via IUCN Red List.